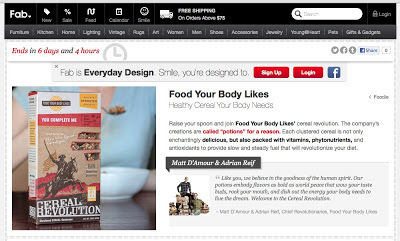 Congratulations to Innovation Kitchen partner Food Your Body Likes! Cereal Revolution will be available for another few days. Then Fab.com will feature their amazing Yumbutter line. "Like you, we believe in the goodness of the human spirit. Our potions embody flavors as bold as world peace that wow your taste buds, rock your mouth, and dish out the energy your body needs to live the dream. Welcome to the Cereal Revolution." Thank you Food Your Body Likes! We are celebrate your food preparation partnership with our Wisconsin Innovation Kitchen!